On July 11, 1969, five days before the NASA launch of Apollo 11 for its historic flight to the moon, British radio listeners were captivated by another moon-bound flight featuring an astronaut named Major Tom. Unlike the Apollo mission, the hero's fate was grim, but the single which spun his tale, "Space Oddity," would not only launch the career of one of rock's most influential musicians, but also, according to Jason Heller's new book Strange Stars: David Bowie, Pop Music, and the Decade Sci-Fi Exploded, a subgenre of music that flourished in the 1970s: sci-fi rock. Inspired by the leading science fiction writers of the 1940s and '50s, sci-fi rock created some of the most indelible sounds of the decade. More than any musician, British rocker David Bowie singlehandedly defined the subgenre, with his sexually charged chameleonic stage personas and sci-fi themed albums Ziggy Stardust and the Spiders from Mars (1972) and Diamond Dogs (1974). Heller, however, contends that a long tradition of artists in all genres expanded on and developed themes that referenced science fiction. Few rock journals acknowledge this influence. Even the SF community has failed to bridge the gap. In his introduction to the book, Heller states that only rarely did the Hugo Awards extend recognition to pop music. In fact, the only time an album was nominated for a Hugo was in 1971, for Paul Kantner and Jefferson Starship's Blows Against the Empire. And, as Heller writes, conversations about artists, like Bowie, who explicitly wrote science fiction "swiftly pivoted to something else––as if a thorough analysis of sci-fi's influence on music was either tangential or trivial." As an exhaustive compendium of artists who drew on science fiction, both lyrically and sonically, Strange Stars does an admirable job of correcting this oversight. Heller, a Hugo-Award nominee (Taft 2012 ) and contributor to Rolling Stone and Pitchfork, brings both a historical context and a fresh eye to the material. The book sets the stage in the fifties and sixties before the release of "Space Oddity," when rock and jazz were taking more challenging musical paths. As early as the 1950s, jazz bandleader Sun Ra and His Arkestra was experimenting with free-form jazz, a black cosmology, and space-age themes with album titles like The Nubians of Plutonia (recorded 1958-9, released 1966) and We Travel the Space Ways (1967). Countercultural musicians, inspired by writers like Arthur C. Clarke, Theodore Sturgeon, and Robert Heinlein, and TV shows such as Star Trek, The Quatermass Experiment, and Doctor Who, also began littering SF references into their music. Zager and Evans's "In the Year 2525," Crosby, Stills and Nash's "Wooden Ships," and Jimi Hendrix's breakthrough hit "Purple Haze," which was inspired by a line in George Stewart's classic sci-fi novel Earth Abides (1949), are a few examples. But it was with the release of "Space Oddity" in the summer of 1969, to capitalize on the moon launch, that a nascent subgenre in pop music properly began. Along with the Apollo 11 landing, another cultural moment in 1969 lit this fuse: Stanley Kubrick's 2001: A Space Odyssey. Adapted by Clarke from his short story "The Sentinel," A Space Odyssey was a watershed event in cinematic achievement. Audiences were wowed by its innovative special effects and themes of space travel, the mysteries of the universe, and alien encounters. For young people, the appeal had a lot to do with its trippy, LSD-induced effects; but musicians, who were already turning to SF for musical inspiration, were also deeply moved by the film. Singer David Crosby, a fan of the film's source, even attempted to get one of his songs, "Space Odyssey," onto the soundtrack (Kubrick instead turned to classical music, most famously Richard Strauss's “Also sprach Zarathustra”). A Space Odyssey, however, had a far greater impact on Bowie. As Heller’s book tells it: "[It] wasn't simply the next psychedelic craze to Bowie. It called to him. Sci-fi was in his blood." Heller no doubt overdramatizes the point, but he isn't far from the truth either. While rockers like Paul Kantner, Hendrix, or Crosby limited their SF references to their music, Bowie embodied it in everything from costumes and elaborate stage sets to the dynamic personae he shed like snakeskin as he took on new thematic incarnations (not unlike a certain titular time-travelling hero, whose regenerations also signal a change in tone and direction). However, his immersion into science fiction didn't happen until after he spent years struggling to find his voice. Early singles like "I'm Not Losing Sleep," which he recorded for Pye Records in 1966, are remarkable only in that they were written by Bowie at all and certainly don't portend the huge impact he'd have on the music scene three years later. So Heller's albeit hyperbolic exclamation is dead-on. It also argues a point he hammers throughout the book: how revolutionary Bowie's "Space Oddity" would be in the history of both rock and science-fiction. Plaintive and haunting, with lyrics about the doomed Major Tom's fears of loneliness and death, "Space Oddity" offered a more existential take on space travel just as the world was awestruck over the optimistic hype of the moon landing. Inexplicably, the BBC played the song over their broadcast of NASA's launch. Heller speculates that the single might have been influenced by another BBC broadcast, an adaptation of Clifford D. Simak's 1951 short story "You'll Never Go Home Alone," retitled "Beach Head" for the anthology series Out of the Unknown. He doesn't offer any proof of correlation outside of the fact that the short film aired while Bowie began recording a demo for the song, but the story's themes––an astronaut suffers a mental breakdown while in space––bears more than a passing resemblance to Major Tom's fate. Bowie, who grew up reading Sturgeon, Heinlein (particularly Starman Jones ), Isaac Asimov, and Ray Bradbury, was nonetheless also taking the first tentative steps in drawing on his childhood influences. 1972 was a banner year for Bowie. He released his fourth LP, Ziggy Stardust and the Spiders from Mars, and introduced the titular lead character as a rock n’ roll alien from outer space. Titles like "Moonage Daydream" and "Starman," along with references to ray guns and space invaders, abound, but it was Bowie's stage persona, decked out in sequins, glitter, and make-up––a star painted over his right eye––which transformed the music into full-on theatricality. His ethereal, otherwordly beauty, which director Nicholas Roeg used to great effect in his 1976 adaptation of Walter Tevis' The Man Who Fell to Earth, elevated the artifice into near-authenticity. As Heller correctly points out, Bowie's embrace of theatricality and artifice stood out in an era when other musicians were stripping down to gritty realism. While he rarely hit the Top Ten Billboard charts, Bowie developed a devoted following of fans who flocked to his concerts while dressed up like him, in one of the earliest incarnations of cosplay. After the release of Diamond Dogs, a dystopian concept album based partly on William S. Burroughs' The Wild Boys (1971) and George Orwell's 1984 (1949), Bowie abandoned overt references to science fiction in his music; but he continued to explore its boundaries by tapping into the endless possibilities of new recording technology, such as the Eventide H910 Harmonizer and other synthisizers, and digital recording devices that flooded the market in the mid- to late-seventies. While Heller covers many groups and artists that fall under the sci-fi rock banner (each of his twelve chapters are devoted to a year in the decade, bookended by the late sixties and early eighties), he understandably focuses on Bowie, whose career and untimely death from cancer in 2016 bookend the volume. Still, Strange Stars is remarkable in its breadth. I grew up during this era, but even I was amazed at the diversity of acts in nearly every musical genre that wrote SF-themed music. Hawkwind, a British band that was a contemporary of Bowie's and in which Limmy Kilmister of Mötorhead fame got his start, recorded albums like 1971's In Search of Space which were explicitly futuristic in theme. Kraftwerk's 1974 album Autobahn invented a sound that embodied futurism without drawing on any explicit SF references. They, along with other, lesser-known German bands, formed a small scene that played "kosmiche musik" (cosmic music), which relied on synthesizers and other digital recording equipment. By the mid-seventies, funk bands like Parliament-Funkadelic joined the party. A collective of different bands fronted and/or managed by bandleader George Clinton, Parliament-Funkadelic fused funky dance grooves with black cosmology, SF references, and psychedelia. Songs like “Mothership Connection (Star Child),” “Sir Nose D'Voidoffunk,” and “Night of the Thumpasaurus Peoples” were unapologetically science fictional. Clinton, who, like Hendrix, loved Flash Gordon and Buck Rogers serials, appeared on the album cover of Parliament's Mothership Connection donning a silver suit and platform boots while leaning out of the hatchway of the Mothership, a spaceship which promised to carry off disciples of the funk to the promised land. Meanwhile, Mandré, the alias of musician Michael Andre Lewis and a Clinton contemporary, wrote musically inventive SF funk in albums Mandré, Mandré II and Mandré 3000, anticipating the rise of house and techno music in the 1980s. To boot, his album covers featured a shiny robot in a tuxedo, a signature look that would crop up again with the industrial band Daft Punk thirty years later. Indeed, the list of bands Heller attributes to SF pop is comprehensive. Along with heavy-hitters like Devo, Rush, Bowie collaborator Brian Eno, Rick Wakeman of Yes, Ultravox, and the Human League, he credits one-off hits like British singer/dancer Sarah Brightman's 1978 disco hit "I Lost My Heart to a Starship Trooper" (no relation to the Heinlein novel)––of which he writes "[the single] threw just about every available sci-fi reference into a pot and stirred vigorously,"––as well as disco composer Meco's 1977 version of John Williams' theme for Star Wars. I could accuse Heller of overdoing it, but that would ignore just how massive even these more minor songs were in bringing SF into the mainstream. Unfortunately, in Heller's eagerness to cover a lot of ground, he ends up leaving some artists, especially women, with the short end of the stick. It isn't that he neglects women; rather, he takes care to include largely unsung artists like Nona Hendryx of the funk group Labelle, the aforementioned Brightman, Graces Slick and Jones, and lesser-known artists like R&B singer Dee D. Jackson, along with sci-fi writers Lois Bujold McMasters, Anne McCaffrey, Octavia Butler, and Ursula K. Le Guin. The problem is that Heller only rates them a bare mention, with Hendryx and Poly Styrene of the punk band X-Ray Spex being the rare exceptions. Is this a case of overlooking women artists in favour of male innovators? Most of the women artists he mentions admittedly were not as influential as Bowie or Parliament, so the real questions are: were women artists given the same opportunities and support in the music industry as artists like Bowie to explore this subgenre, or were they limited to subjects (for example, romantic love songs) that were stereotypical for women singers and performers? Heller doesn't address that question or offer a broader cultural critique, but considering that he includes singers like Brightman and Dee D. Jackson, who rarely make it into books on the history of pop music, I suspect that this oversight has more to do with his eagerness to list as many artists as he could think of that fit into the subgenre. In so doing, however, he introduced me to artists I'd never heard of before, men and women both, which is why I'm willing to give him a more generous reading of the book’s gender imbalance. The book's chronological structure doesn't leave much wiggle room either. Considering this is the first of its kind to explore the influences of science fiction had on pop music, I think it only points out how much this subject can be further explored. Certainly, I wanted to know more about these groundbreaking artists and their influence on SF rock. Heller's fascination and enthusiasm for both pop music and science fiction is infectious and accounts for the bulk of my enjoyment of Strange Stars. 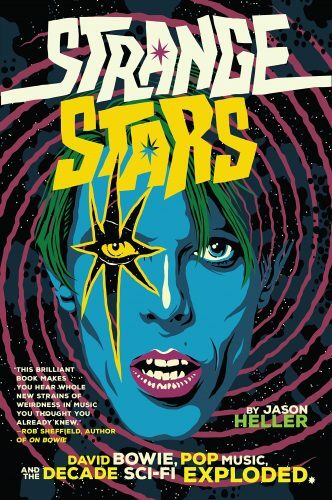 Artists who would otherwise be forgotten or written off as inconsequential are respected in the same vein as giants like Bowie, which speaks to the author’s conviction that SF pop is a subgenre worthy of serious consideration. I learned a lot while reading Strange Stars, discovered new artists and rediscovered old ones, while gaining an appreciation for a genre of music that is largely unacknowledged, even within the science fiction community itself.